Description: Very short local thru Greer. Description: While down by the river Q108's power came up on the NYSW section of the bridge to make a reverse move. Description: A southbound coal train passes Wyvern Yard. Description: CSX 768 leads a westbound Coke Express train (K357-09) through Trowbridge siding, near the Farm Lane crossing. Description: A loaded coal train moves from the Columbus Sub to the Willard Sub. 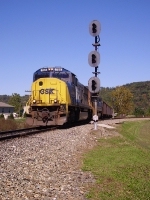 Description: A westbound CSX coal train passes the old Amtrak platform. Description: CSXT 768 leads another trainload of hoppers around the wye at St. Albans, on their way back to the mines for another load of coal on a former C&O branch.